November is the time of year when we reflect on everything for which we are most thankful. And with Veteran’s Day on November 11, the nation pauses to honor the sacrifices of those who have bravely served in our armed forces. While we give particular recognition and thanks on these designated days, we are afforded an opportunity to find ways that we can continue to give back throughout the year, and also recognize the importance of serving our veterans in meaningful ways every day and not just on national holidays. For decades, the National University System (NUS) has been deeply committed to one of its founding principles of serving the military and veteran community. It has served these students by delivering specialized programs, awarding scholarships and offering support through resources such as the VALOR Center at JFK University, the Veteran Center at National University and a variety of partnerships and programs at City University of Seattle. Through the System’s new Innovation Grant Program, there are new developments designed to further promote academic success among our veteran students as they transition to civilian life. And the System continues to find ways to facilitate this transition, such as the opening of the new location at Joint Base Lewis-McChord. We are also very thankful for our wonderful community partners. Recently, I was honored to present Malin Burnham with the 2016 Humanitarian of the Year award on behalf of National University’s Sanford Institute of Philanthropy. Malin is one of San Diego’s greatest philanthropists and is recognized nationally for his generosity of spirit and leadership. Each year, this award is granted to a person with a demonstrated commitment to giving back to others and the community through philanthropy for the betterment of our society and humanity. In past years this award has gone to two other great philanthropists, T. Denny Sanford and the late Conrad Prebys. November 15 is National Philanthropy Day, when we can take time to reflect on some of our biggest community supporters, such as Denny Sanford, who is ranked among the most generous donors nationwide. 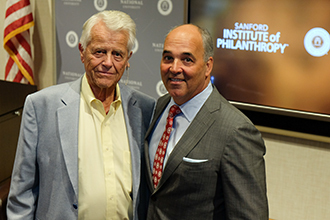 Denny is the inspiration behind the Sanford Institute of Philanthropy, which offers support and resources through educational training programs to help nonprofits increase their fundraising capabilities and positive impact on society. 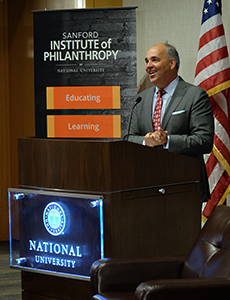 The Institute was launched at the flagship university of the National University System, National University, which is leading the expansion of a network of affiliate Institutes of Philanthropy in coordination with other educational institutions, including NUS affiliate, John F. Kennedy University.